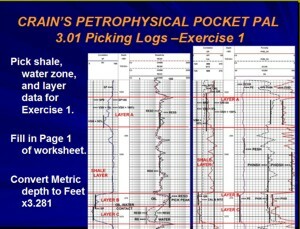 Each course is a complete multi-media package including a comprehensive slide show, narration on each slide with additional commentary, helpful tips, and trade secrets, full colour textbook-quality reference manuals, exercises, quizzes, and spreadsheet software, plus access to Crain's Petrophysical Handbook Online for additional depth and advanced topics -- a true multi-media experience. These practical, no-nonsense courses are time-tested in major and independent oil companies, service companies, consulting firms, and government agencies, and are backed by 50+ years of worldwide experience. Use Crain's Integrated Petrophysics Courses as assisted self-study courses for individuals or as part of a monitored in-house study program for the entire exploitation team. Choose from 4 full-length or 7 short-courses. As a low-cost alternative to in-house presentations, consider using Crain's Integrated Petrophysics Courses as a technically sound solution. A Certificate of Proficiency is awarded to students who successfully complete all exercises contained in a full-length course (AV-01, AV-02, AV-03, AV-04). See details HERE. Which Self Directed Course is best for you? See all detailed Course Outlines HERE. Academic License: enter Quantity = 5 on PayPal order page. Corporate License or Associate Instructor License: enter Quantity = 10 on PayPal order page. Allows participants to move ahead at their own pace. Provides step-by-step procedures for log analysis. Gives insight into rock quality versus well performance. provides worked examples for further study. Provides permanent, high quality reference materials. Answer oriented results, with quality control guidelines.